Joan Joyce is just one of many members in the ballet corps. Her biggest claim to fame is helping famous Russian dancer Arslan Ruskov defect and escape to America. But Arslan views her as just one of many admirers and Joan comes to accept that she will not have an amazing career like he will. Instead of pursuing ballet, she marries former boyfriend Jacob and focuses on raising their son Henry. He has many things in common with his mother and as his star begins to rise in the world of ballet, Joan realizes that Arslan must come into their lives again. The consequences of their reunion will forever shatter their carefully composed lives. I almost didn't read this book. I found Shipstead's debut fine, but not a story that I adored. Astonish Me, however, is an excellent book and I'm so glad I added it to my reading list. The two stories seem to almost be opposites, which speaks to this writer's talent. Seating Arrangements is about losing inhibitions - the setting is a weekend of alcohol and sexual liaisons. In this tale, everything is about control. Dance is about controlling your movements, your diet, and your body. The characters are desperate to maintain control over their lives, their loved ones, and their destinies and the realization that such a thing is not always possible is both horrifying and elating. This story operates on dual planes - the first one is all about relationships. But the second is about longing and settling. Joan did everything right to achieve a career in ballet, but finds herself living an ordinary life. Her son Henry longs for success and recognition, at any cost. Arslan flaunts his fame, searching for something that fills the emptiness of leaving behind his native land and everything that he loved. Joan and her husband Jacob sustain a mediocre relationship. Both love the other, but they need things from their partner that they are either unwilling or unable to give. The spouses find themselves on opposite sides of almost everything - Joan is all about physicality even when she has stopped dancing professionally. She still eats sparingly and keeps her body in dancing shape. Jacob, on the other hand, is all about intellect. He works as a teacher of advanced students and is more concerned with expanding knowledge than with maintaining a perfect physique. Parts of the plot seem overly familiar and perhaps predictable, but the reader won't mind. Shipstead understands longing and is able to articulate it in a very urgent and lovely way. 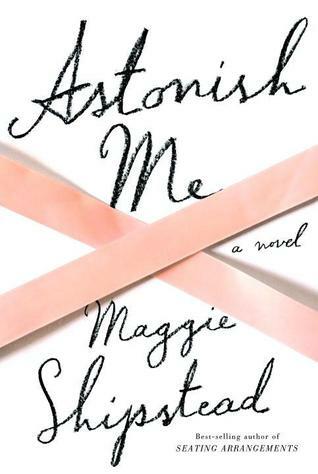 Astonish Me is one of my favorite books of the month, if not the whole year. I've resisted trying this one, but I'm not sure why. I loved your review and it gives me hope that I will possibly love it. For some reason I've always been drawn to books about ballet and dancers...I don't know why. It's not like I ever took ballet, but still I love to read about it. :) Great review. Might give this one a try. It's one of those fascinating worlds that we aren't all privy to seeing, isn't it?? What other books about dance have you enjoyed? Bunheads by Sophie Flack was a lot of fun; I also loved Drenched in Light by Lisa Wingate. I read a great biography of Margot Fonteyn once, too, but I can't remember its title. This one sounds interesting and I enjoyed your review! I think I'm going to add it to my ever-growing TBR list haha! :) Thanks for visiting my blog! xo! Then I suppose my work here is done! :) I hope you enjoy Astonish Me as much as I did. Great review! Now that you've described her two novels as opposites, I'd be interested in reading them together (I haven't read Seating Arrangements, but it's one I've considered reading). Thank you! I didn't like Seating Arrangements that much but I think it had more to do with yet another wealthy white man having a midlife crisis as opposed to Shipstead's writing.